The compressed hydrogen-powered Honda FCX runs so clean, its exhaust contains only water—and it's so clean, it's drinkable. 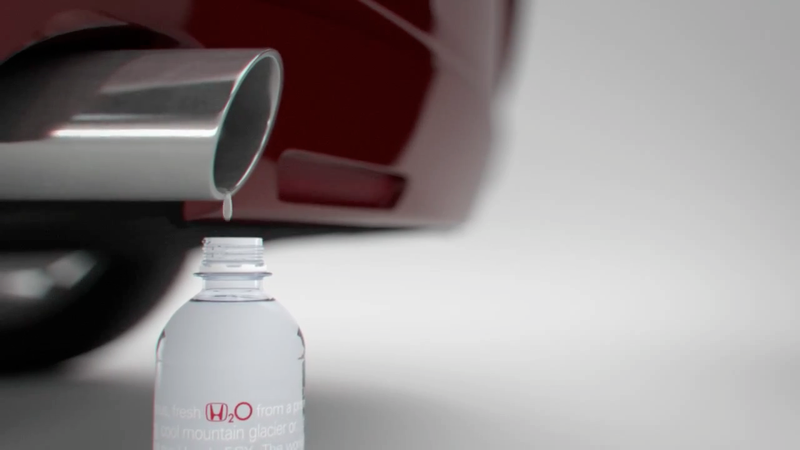 To celebrate this, Honda Australia and Leo Burnett Melbourne came up with a memorable stunt—creating a new bottled-water brand, H2O. As seen in the case study below, the automaker gave the water away in movie theaters around Australia (as free samples, no less) as a way of showing people what they're doing for the environment. There are also plans to make the water available at Honda service stations and dealerships. Copy on the bottle reads: "Delicious, fresh H2O from a pristine mineral spring, cool mountain glacier or … the exhaust pipe of the Honda FCX. The world's first hydrogen-powered car that emits only water. Water so clean and pure, you could put it in a bottle and drink it. Now isn't that refreshing?" Note the use of "could." It doesn't appear that this water is actually the by-product of FCX. Still, a neat idea. The product is nicely designed, too, with an effective minimalist aesthetic. I really like how well the Honda logo works as the hydrogen symbol in H20.